This page was printed from http://www.crosleycompany.com/video-managing-your-growth-pipeline/. Visit www.crosleycompany.com for more information. 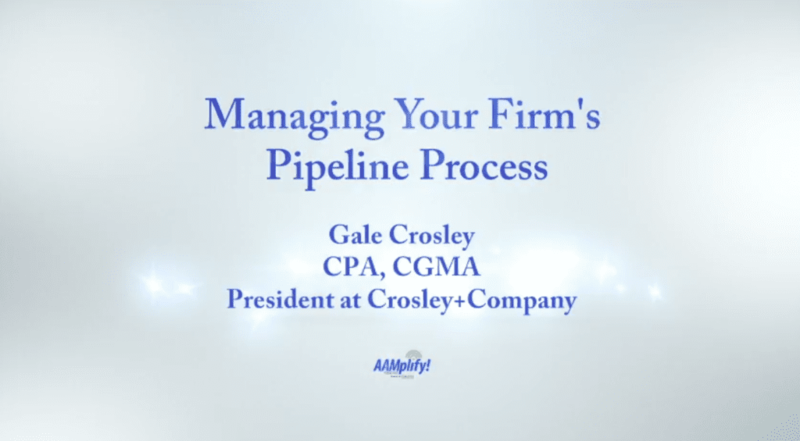 Gale Crosley recently spoke with Katie Tolin of CPA Growth Guides for an episode of AAMplify!, a podcast series created by the Association for Accounting Marketing. In the podcast’s partner video below, Katie and Gale discuss the critical aspects of managing an accounting firm’s growth pipeline. They go into important issues like what should and should not be a part of a pipeline document, as well as managing the opportunity pursuit process so that it leads to overall growth and increased revenue. Click the image below to watch the full episode.